Transparent conductive oxide coatings, commonly called TCO coatings, are a type of inorganic TCF (transparent conductive film) used in electronics. Since TCO coatings are used for solar cells and displays, the market is being driven by continuous growth of demand in consumer electronics, particularly smart devices. These coatings are also regularly used for automobiles, medical devices, construction and aerospace & defense, as well as eyeglasses. TCO coatings are transparent and electrically conductive and are often used in photovoltaics, LCDs (liquid crystal displays), OLEDs and touchscreens. Indium tin oxide (ITO) is one of the most commonly used inorganic thin films due to its high transmittance and low resistivity. However, it can be toxic and, as a rarer metal, it can be expensive. As a result, many companies are investigating AlZnO as an alternate high performance TCO material. For TCO coatings, magnetron sputtering is a good low cost/high volume solution. You can sputter an ITO target in an O2 background for stoichiometric films using Denton’s Discovery Cluster tools, or use the Phoenix system for high volume mass production of mirrors and displays. 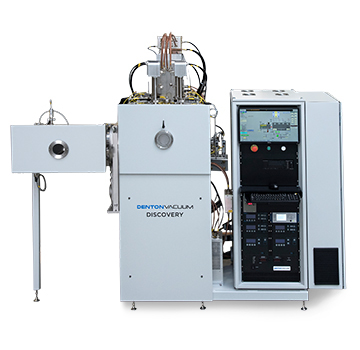 Learn more about these sputtering systems by selecting one below.